“D3: The Mighty Ducks” is the first movie title I've seen that correctly predicts its grade on Entertainment Weekly's movie report card: a D. The Mighty Ducks, Minnesota's underdog kid hockey team, are back again, in a third version of more or less the same story: Evil, petty, vindictive, mean-spirited, cheating, lying snobs try to stop them, but the Ducks, after first dealing with cockiness, infighting, pride, anger and a new coach, redeem themselves in the big match. “You've never heard of the Anaheim Mighty Ducks?” asks Charlie, the team's top scorer. “They named a pro team after us!” He uses this as a pick-up line with a cute brunet. Maybe it would have worked even better if he'd added, “And the same company that owns the team produced all three Mighty Duck movies, in a transparent exercise of cross-promotion!” As the movie opens, the state champion Ducks have all been given scholarships to snobby Eden Hall, a private academy with a hockey program so good that they have more flags hanging from the ceiling of their arena than a used-car lot on Washington's Birthday. Not everyone is happy about these newcomers, who bring blacks, Asians, Jews, fat kids and even a girl into the famous hockey program, which is apparently otherwise made up mostly of rich white snobs. Leading the bigots is the sneering Dean Buckley (David Selby), who tries everything he can think of to sink the scholarships. And then there's the varsity coach (Jack White), who is capable of pep talks to his boys like: “They don't belong in our school. 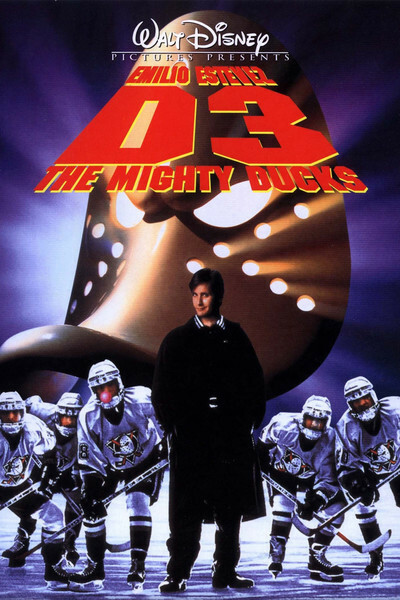 Now show them why!” The Ducks are devastated as the movie opens to discover that beloved Coach Bombay (Emilio Estevez) won't be with them anymore. Bombay, the hot-shot lawyer who began coaching them as a form of court-ordered community service, has moved on to the Junior Goodwill Games. Their new coach is a former pro player named Coach Orion (Jeffrey Nordling), who lectures on defense. “I'm a scorer,” sniffs the star player, Charlie (Joshua Jackson). We've seen more than one movie, and can guess where *that* kind of talk will lead, although we are not prepared for the way the script delivers with a bludgeon rather than a scalpel: The Ducks go out to a 9-0 lead, but don't play defense, and so their opponents then score 9 straight goals to tie the match. The movie's desperation can be seen in several totally contrived scenes, of which the most obvious shows the fat kid losing control while on in-line skates, rolling away while Charlie speeds to rescue him. The kid, screaming piteously for help, rolls down a flight of stairs, into city traffic, past snarling dogs, etc., while sometimes skating on one leg, knocking over garbage cans, etc., and finally flying through the air and somehow landing just as Charlie is able to save him. The problem here is that only one of the best skaters in the world could possibly have performed well enough to do all of these stunts; we wonder whom the movie is trying to fool. Most of the dramatic scenes involve a feud between the freshman Ducks and the snob varsity, who stick them with the bill at an expensive private club, leading to the first movie scene since the 1930s in which we are asked to believe that the penniless diners could work off their bill by washing dishes. Other time-killers include a scenic trip to the Mall of America, and a curious side plot involving old Hans (Joss Ackland), who has followed the team since the beginning, always believed in them and listens to their games on the radio while shaking his head sadly at their follies. Hans is a familiar kind of movie fixture: a character obviously doomed to die before the end of the film. I've gotten to where I can spot them in their first shots, and I whisper “He's gonna die!” to my wife, who tells me to be quiet and watch the movie. At the end of the film, there is skullduggery involving the Ducks' free scholarships, which of course can be settled if they win a big match and if Coach Bombay comes back to practice his formidable legal skills. Everyone in the movie seems to agree that athletic skill is the only criterion for scholarships at Eden Hall, a school where I cannot remember anyone ever taking any classes, although my attention may have wandered. Will there be a “D4”? Do ducks quack?